The becoming of Queen Elizabeth I - that's how you can best describe the plot of the movie "Elizabeth" starring Cate Blanchett released in 1998 and widely acclaimed. The story is a rather easy, yet bloody one: A young Elizabeth, after being imprisoned by her half-sister, becomes Queen of England at the age of 25 and she doesn't know what to do and who to trust while being thrust into the middle of a political and religious firestorm she doesn't quite understand. Having your father behead your mother and your sister as one of your biggest enemies also doesn't help with trusting people or having any education for the role you were never supposed to have to begin with. 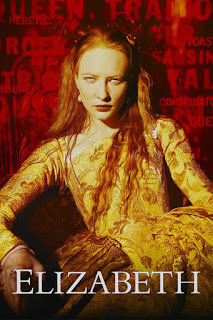 It's an interesting tale I have watched twice in my life - and started to watch it a couple of times inbetween - and while I have to say that I liked the portrayal of Elizabeth by Blanchett, the movie never really clicked with me. Was it due to the male roles in the movie? The arty production? The fact that I'm not extremly interested in the British royal family to begin with? I don't know. But please, don't refrain from watching it as it still is a classic and lavish period drama. I will need to find the second part "Elizabeth - the Golden Age" and see if it maybe finally clicks with me.